The Continental Sport Contact 5P MO is a great top end tyre that is suitable for high end cars that need that extra performance. The Sport Contact 5P will deliver great handling and a smooth drive whilst having the added safety feature of shorter breaking distances and reduced aquaplaning when the roads are wet underfoot.The Sport Contact 5P will give you maximum grip in all conditions. An excellent high performance tyre. 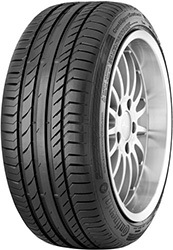 The Continental Sport Contact 5P MO tyre has been specifically designed for Mercedes vehicles.